I grew up listening to the beautiful tenor voice of Richard Dyer-Bennet, the so-called “twentieth-century minstrel.” This page is my tribute to him. Please e-mail me with comments and suggestions. Richard Dyer-Bennet: The Last Minstrel will be published in December, 2009 by the University Press of Mississippi. It is available for pre-order from Amazon.com. Thanks to Brian Bergen for his assistance. 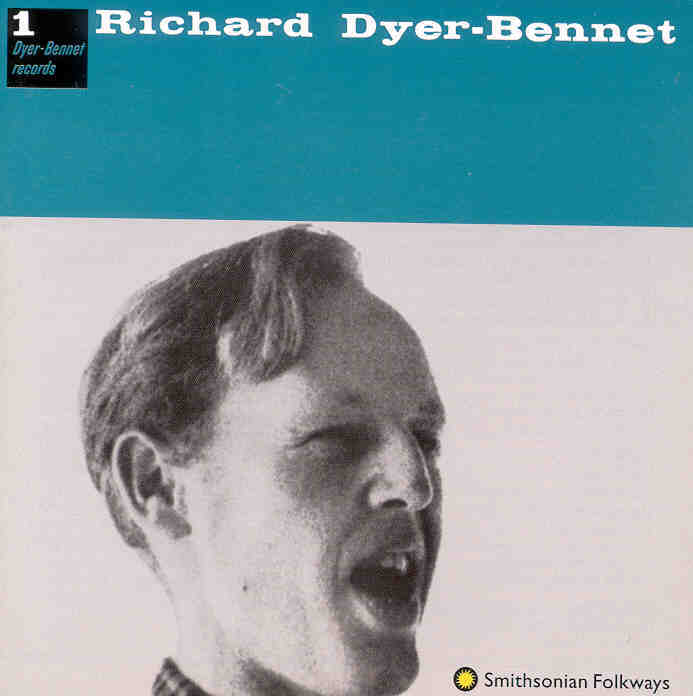 Smithsonian-Folkways recently re-released on compact disc the 14 albums Dyer-Bennet recorded on his own label. Scans of a 1944 Town Hall program from one of Richard's performances. Earlier this year, Smithsonian-Folkways released 14 CDs originally recorded by Richard Dyer-Bennet (1913-1991) for his own label, Dyer-Bennet Records, between 1955 and 1965. To order Richard Dyer-Bennet CDs from Smithsonian-Folkways, click here. These reissues will no doubt be well received by those already familiar with the so-called “twentieth-century minstrel.” My intention, however, is to acquaint a new generation of folk music fans with Dyer-Bennet’s life and body of work. Richard Dyer-Bennet's road to Stockholm and Scholander began in Leicester, England, where he was born October 6, 1913. His father, Richard Stewart Dyer-Bennet, was an officer in the British army. Mrs. Dyer-Bennet, born Miriam Wolcott Clapp in Illinois, was reared in California. Both enjoyed music and often played the records of Caruso and John McCormack. The family moved to Canada in 1919, and then to California in 1925 after Dyer-Bennet’s father had separated from his mother. Young Richard accompanied his mother to Germany in 1929 and returned home to study literature at Berkeley in 1932. The following year at a Christmas party, Dyer-Bennet was asked to sing a few songs. Afterwards, Gertrude Wheeler Beckman introduced herself to Dyer-Bennet and suggested he make a career of what up till then had been merely a hobby. Beckman offered to train his voice, for she saw in the young student a possible successor to Scholander, whose work she had long admired. Back home in Berkeley, Dyer-Bennet dropped out of school--"because now I could read Goethe for myself, you know" (5)--but continued to study with Gertrude Beckman. Together they worked on seventeenth- and eighteenth-century Italian songs, as well as pieces by Handel, Mozart, Schubert, Schumann, Franz, Brahms, and Wolf. In 1941 Dyer-Bennet moved to New York and quickly became part of the great folk music revival underway there. He found work singing first at Le Ruban Bleu, a night club run by Herbert Jacoby, and then at the famed Village Vanguard in Manhattan, where he honed his art and became a thorough professional. Dyer-Bennet's appearances on stage at the Vanguard happily surprised its clientele. More accustomed to hearing the latest jazz acts, the audience gradually came to embrace the folk material of Burl Ives. Yet they hardly knew how to react when Dyer-Bennet appeared on stage in full evening dress and began to sing ballads that were centuries old. Two regular Vanguard fans of Dyer-Bennet were Mike Quill and Ted Zittel. Quill was involved in the Transport Worker's Union, and Zittel was his publicity man. Zittel arranged for Dyer-Bennet to sing for the union at Madison Square Garden, and then helped to arrange his first recitals at New York's Town Hall in 1944. Later that same year Dyer-Bennet sang at Carnegie Hall. Audience and critic alike responded warmly to Dyer-Bennet’s bel canto versions of American and European folk songs. The years following the war were busy ones for Dyer-Bennet. He gave more than 50 concerts a year and recorded nearly 140 songs for a number of labels, including Stinson, Keynote, Continental, Mercury, Concert Hall, Decca, Vox, and Remington. An attempt to found a school of minstrelsy in Aspen failed, however, and then, in the fifties, Dyer-Bennet, along with Pete Seeger, Oscar Brand, and many others, was listed in Red Channels, a book published to expose those linked in various ways to the Communist Party. Thus besmirched, the twentieth-century minstrel found himself the object of right-wing protests. 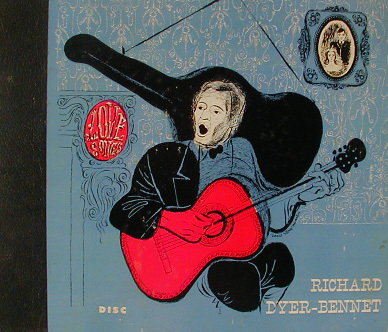 Bookings began to dry up, and Dyer-Bennet decided to concentrate on his recording career. With the help of Harvey Cort, his partner/producer, and J. Gordon Holt, a recording engineer, the minstrel founded Dyer-Bennet Records. In one part of the Great Barrington, Massachusetts home to which he and his family had moved in the early 1950's, Dyer-Bennet set up a control room and recording studio. From 1955 to 1965 he would record at least one album annually in domestic comfort. 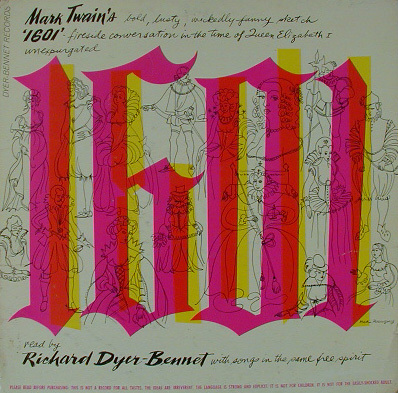 Over half of Dyer-Bennet’s recorded songs date from the 19th century, a quarter from the 18th and 17th, and the remainder from earlier times. More than half originated in the United Kingdom, a third in the singer's adopted homeland of America, and the rest in western Europe. Dyer-Bennet learned these songs from a vast number of people and sources. Many came from Scholander, of course, but other sources were fellow singers Burl Ives, John Jacob Niles, Leadbelly, Tom Glazer, and John McCormack. Still others were found in folk song collections such as Carl Sandburg's American Songbag, or Thomas Percy's famous 18th century work, Reliques of English Poetry. 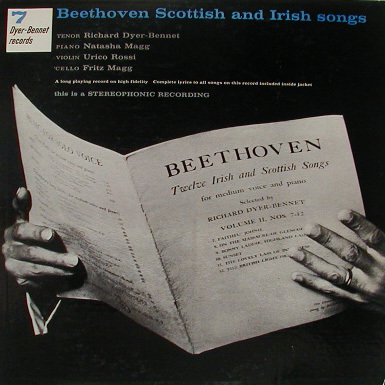 On the fourteen albums recorded for his own label, Dyer-Bennet also set to music the poetry of Yeats, Byron, Charles Kingsley, Bret Harte, Robert Burns, Ben Jonson, Shakespeare, and Goethe, as well as compositions by sixteenth-century minstrels Thomas Campion and John Dowland. 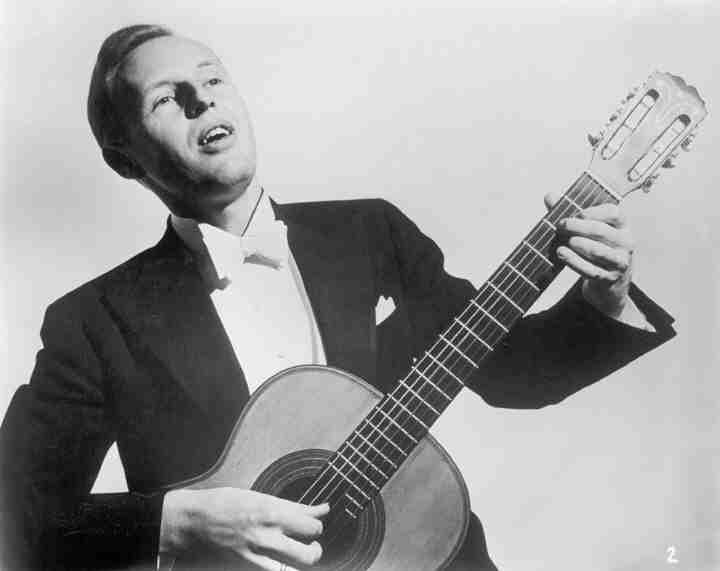 During the last fifteen years of his life, the twentieth-century minstrel devoted himself to two major projects. In the mid-seventies he performed and recorded his own translation of Schubert’s “Schoene Muellerin”song cycle. Then, in 1978, the National Endowment for the Humanities awarded him $100,000 to pursue the enormous task of recording Robert Fitzgerald’s translation of Homer’s Odyssey. Although he gave numerous declamations of excerpts from the work, and recorded some of them for posterity, Dyer-Bennet died of cancer in 1991 before he could complete the work. He was survived by his wife, Melvene, and his four daughters, Eunice, Ellen, Bonnie, and Brooke. He left behind an extensive body of recorded work, and an indelible impression on the thousands who heard him perform on stage. 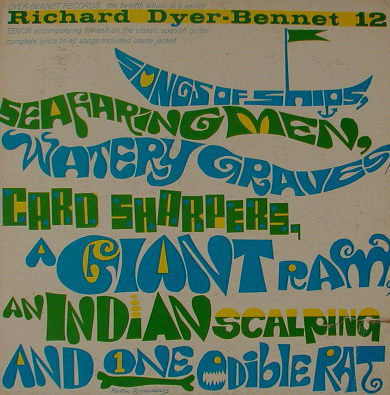 Richard Dyer-Bennet was one such singer. He found songs that had permanence and introduced them to an entirely new audience. He was inspired by tradition, but never became its slave. Beckman and Scholander set him on his way, but the road he traveled was very much his own. (1) Everett Helm, "Richard Dyer-Bennet: Folk Singer in White Tie," Musical America, February, 1963, p.43. (2)Richard Dyer-Bennet, "A New Age of Minstrelsy," HiFi/Stereo Review, July, 1961, p.33. (3) Nat Hentoff, "The Last Minstrel", The Reporter, 31 January, 1963, p.52. (4)Frank K. Kelly, "Dyer-Bennet: A Painter in Song", date and source unknown. (5)J.M.Conly, “Minstrel on a Peninsula,” Atlantic, February, 1960, p.104. (10)Richard Dyer-Bennet, album notes for Richard Dyer-Bennet 7, 1958. (11)Richard Dyer-Bennet, interview by Studs Terkel,WFMT radio, Chicago, 1955(?). (12)Richard Dyer-Bennet, album notes for Richard Dyer-Bennet 11, 1962. (14)Alfred Frankenstein, "Dyer-Bennet Records Foster's Songs as He Wrote Them", San Francisco Sunday Chronicle, 16 December, 1962. (15) Richard Dyer-Bennet, "A New Age of Minstrelsy," HiFi/Stereo Review, July, 1961, p.32. (16) Howard Schneider, "Richard Dyer-Bennet Was an Anachronism--a 20th-Century Minstrel", Denver Post, 8 April, 1973, p.18. (17) Richard Dyer-Bennet, "A New Age of Minstrelsy," HiFi/Stereo Review, July, 1961, p.32. Baruch, D.J. "Richard Dyer-Bennet." Musical America. March, 1960. Beckett, Henry. New York Post Magazine. February 25, 1944. Bowen, J. "Schiotz file." Saturday Review. September 24, 1960. Brand, Oscar. 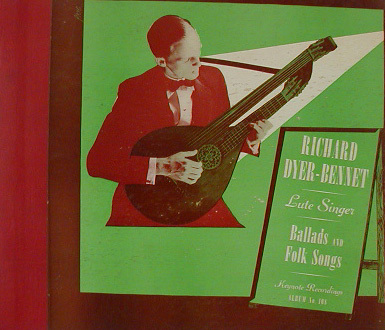 "Richard Dyer-Bennet (1913-1991), twentieth- century minstrel." Sing Out. 1992. Clines, Francis X. "An epic reading out of an epic life." New York Times. December 5, 1978. Collins, Fletcher. Almanace Play-Party Songs and Singing Games. Norwood Editions, 1940. Collins, Fletcher. A Medieval Songbook: Troubadour and Trouvere. University of Virginia Press, 1982. Conly, J.M. "Minstrel on a peninsula." Atlantic. February, 1960. Current Biography. "Solomon Hurok." September, 1941. Current Biography. "Richard Dyer-Bennet." June, 1944. Current Biography. "Askel Schiotz." March, 1949. De Toledano, R. "Mark Twain, obscenity, folk songs." National Review. August 27, 1963. Dunaway, David. How Can I Keep From Singing: Pete Seeger. New York: Da Kapo, 1981. 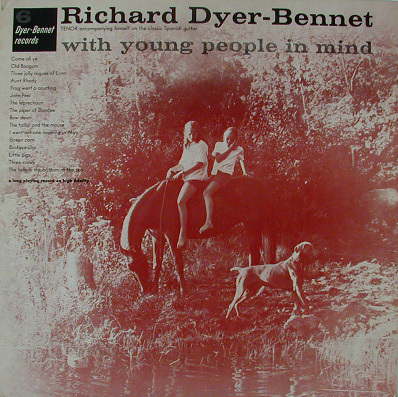 Dyer-Bennet, Richard. 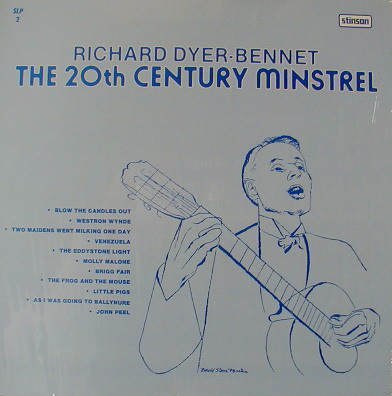 Richard Dyer-Bennet, the 20th Century Minstrel: A Collection of 20 Songs and Ballads with Guitar and Piano Accompaniments. New York: Leeds Music Corporation, 1946. _______. Interview by Studs Terkel. Chicago, WFMT radio. 1955, 1962. _______. "A new age of minstrelsy." Hi Fi/Stereo Review. July, 1961. _______. Die Schoene Muellerin: The Lovely Milleress (score). New York: Schirmer, 1967. _______. The Richard Dyer-Bennet Folk Song Book. New York: Simon and Schuster, 1970. _______. "The Odyssey Project." Program Notes to Coolidge Auditorium World Premiere of Three Excerpts from Robert Fitzgerald's translation of Homer's Odyssey. October 15 and 16, 1979. Fleming, S. "Richard Dyer-Bennet; a modern minstrel pursues an ancient art." High Fidelity: The Magazine for Music Listeners. March, 1963. Folkart, Burt A. "Richard Dyer-Bennet; folk troubadour and guitarist." Los Angeles Times. December 17, 1991. Fox, Catherine. "A tale for the telling." Maclean's. November 19, 1979. Gordon, Max. Live at the Village Vanguard. New York: Da Capo Press, 1982. Helm, Everett. 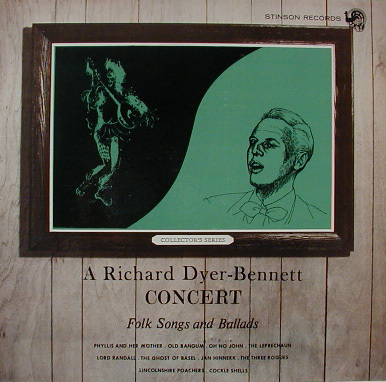 "Richard Dyer-Bennet: folk singer in white tie." Musical America. February, 1963. Hentoff, Nat. "Last minstrel." Reporter. January 31, 1963. High Fidelity/Musical America. "Richard Dyer-Bennet, tenor ('The Lovely Milleress'--his translation of Franz Schubert's 'Die Schoene Muellerin')." May, 1977. Jones, M. and Traill, S. "Collector's corner." Melody Maker. May 23, 1953. Kaplan, R. "Minstrel in white tie." Coronet. May, 1958. Kelly, Frank. "Dyer-Bennet: a painter in song." Publication unknown. September 26, 194(3?). Kirchhoff, H.J. "A storyteller and his Odyssey." Boston Globe and Mail. October 29, 1988. Klein, Joe. Woody Guthrie: A Life. New York: Knopf, 1980. Lawless, Ray M. Folksingers and Folksongs in America. Westport, Connecticut: Greenwood Press, 1981 (c1960). McDonald, Ron. "When Homer has his way." Smith Alumnae Quarterly. February, 1981. Musical America. 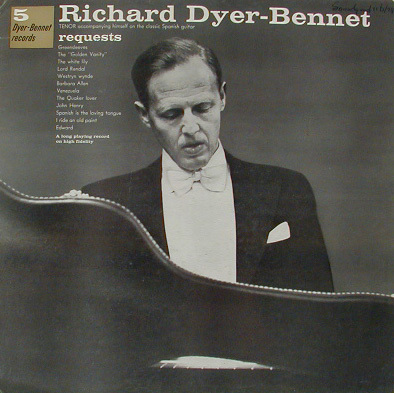 "Richard Dyer-Bennet, tenor." December 1, 1949. _______. "Richard Dyer-Bennet." December 1, 1950. _______. "Richard Dyer-Bennet." December 1, 1951. _______. "Richard Dyer-Bennet." December 1, 1953. _______. "Richard Dyer-Bennet." March, 1957. _______. "Richard Dyer-Bennet." December 1, 1958. _______. "Richard Dyer-Bennet." April, 1960. Musical Courier. "Richard Dyer-Bennet." December 1, 1951. _______. "Richard Dyer-Bennet." March 1, 1957. New Grove Dictionary of Music and Musicians. Edited by Stanley Sadie. London: MacMillan, 1980. New York Times. February 27, 1944. Newsweek. "Twentieth-century bard." March 13, 1944. Percy, Thomas. Reliques of Ancient English Poetry. New York: Dover, 1966. Porter, Andrew. "Lieder in English?" High Fidelity/Musical America. April, 1979. Program Notes to Concert at Gustavus Adolphus College (St. Peter, Minnesota) Concert. November 20, 1968. Robinson, Harlow. The Last Impresario: The Life, Times, and Legacy of Sol Hurok. New York: Viking, 1994. Russcol, H. "I gave my love a cherry, so tell it like it is, baby!" High Fidelity/Musical America. December, 1968. Schneider, Howard. "Richard Dyer-Bennet was an anachronism--a 20th-Century minstrel." Denver Post. April 8, 1973. Scholander, Sven. Visan, lutan, och jag. Stockholm: Lars Hokersbergs Bokforlag, 1933. Schubert, Franz. "Die Schoene Muellerin." Score. Text translated as "The Lovely Milleress" by Richard Dyer- Bennet. New York: G. Schirmer, 1967. Shelton, R. "Bridging the gap." New York Times. April 16, 1961. _______. "A jousting minstrel." New York Times. November 18, 1962. Time. "Young man with a lute." October 13, 1941. Young, H. "Tenor with guitar." Counterpoint. February, 1953. Yurchenco, H. "Folk music in New York." Musical America. February, 1963. American Record Guide. "Dyer-Bennet has produced a masterpiece." January, 1963. Bell, Nelson. "About the showstops." Washington Post. April 10, 1944. Biancholli, Louis. 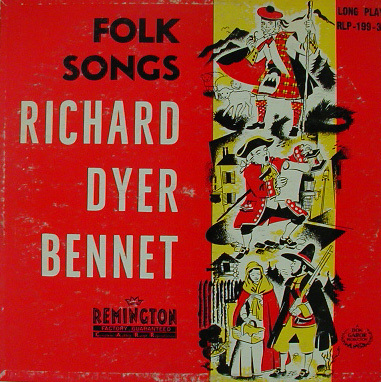 "Dyer-Bennet in folk songs." New York World Telegram. March 6, 1944. Bowles, Paul. "Dyer-Bennet recital." New York Herald Tribune. December 31, 1945. Brown, Ray. "Postlude." Washington Post. April 13, 1944. Cochrane, Robert B. "Concert at museum." Baltimore Sun. July 27, 1944. Davis, Peter G. "Music: rarities." New York Times. January 24, 1977. De Sayn, Elena. "Unique recital of ballads given by Dyer- Bennet." Washington Star. April 10, 1944. Frankenstein, Alfred. "Dyer-Bennet presents his folk songs in recital." San Francisco Chronicle. March 26, 1946. _______. 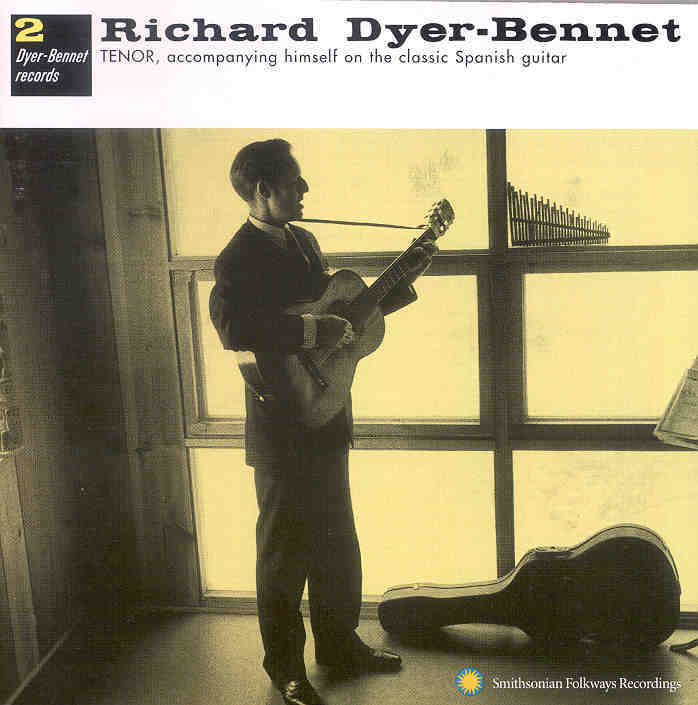 "Dyer-Bennet records Foster's songs as he wrote them." San Francisco Sunday Chronicle. December 16, 1962. Fried, Alexander. "U.C. balladist makes good." San Francisco Examiner. March 25, 1946. Gunn, Glenn Dillard. "Dyer-Bennet pleasing in his recital of ballads." Washington Times-Herald. April 10, 1944. Musical America. "Town Hall recital." March, 1957. New York PM. "Musical diary." March 6, 1944. _______. "Musical diary." May 8, 1944. New York Sun. "Richard Dyer-Bennet sings in Town Hall." December 31, 1945. New York Times. "Dyer-Bennet gives ballad program." March 5, 1944. _______. "Dyer-Bennet sings to capacity crowd." November 19, 1944. _______. "Dyer-Bennet sings a varied program." December 30, 1945. Porter, Andrew. "Song in green." New Yorker. February 28, 1977. Wolff, Ruth. "Dyer-Bennet S.F. concert is acclaimed." Berkeley Gazette. March 27, 1946. Albums are listed in chronological order by title, followed by recording date, recording company, album number, and what I've called an appendix code. This code is an abbreviation I've used in the appendices B and C to represent the albums below. An alphabetical listing of each album's songs is also given. All albums listed are 33 1/3 LP's unless otherwise indicated. BALLADS. 78 rpm. Date unknown. Stinson. 364. Appendix Code: S364. MINSTREL SONGS OF THE USA. 78 rpm. 1947? Vox Records. 632. Appendix Code: VOX. Blue Mountain Lake, Colorado Trail, Lass From the Low Country, Old Bangum, Quaker Lover, Turkish Reverie, Were You There? 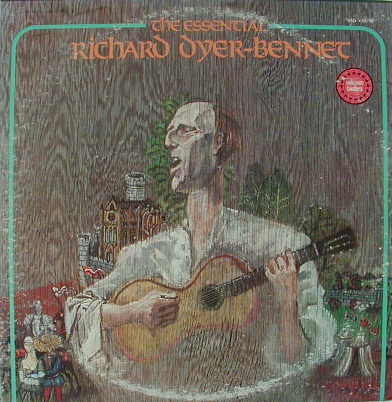 RICHARD DYER-BENNET, TWENTIETH-CENTURY MINSTREL. 1949. Decca. DL79102. Appendix Code: DL79102. RICHARD DYER-BENNET. 45 rpm. 195? Dyer-Bennet Records. Appendix Code: D45. FOLK SONGS. 195?. Continental Records. CST-2011. Appendix Code: CST-2011. RICHARD DYER-BENNET SINGS OLDEN BALLADS. 195?. Mercury. MG 2007. Appendix Code: MER. SCOTTISH SONGS. (SCHOTTISCHE LIEDER). 195?. Concert Hall. CHC-13. Appendix Code: CHC-13. SIX IRISH SONGS. 195?. Concert Hall. Appendix Code: CHIR. RICHARD DYER-BENNET 3. 1957. Dyer-Bennet Records. DYB 3000. Appendix Code: 3. RICHARD DYER-BENNET 4. 1957. Dyer-Bennet Records. DYB 4000. Appendix Code: 4. RICHARD DYER-BENNET 8. 1959. Dyer-Bennet Records. DYB 8000. Appendix Code: 8. RICHARD DYER-BENNET. 196? Archive of Folk Music. FM-103. Appendix Code: FM-103. RICHARD DYER-BENNET 9. 1960. Dyer-Bennet Records. DYB 9000. Appendix Code: 9. MORE SONGS BY THE 20th-CENTURY MINSTREL. 1962. Stinson Records. SLP60. Appendix Code: SLP60. Blue Mountain Lake, Charleston Merchant, Colorado Trail, Come All Ye, Early One Morning, Eggs and Marrowbone, Lass From the Low Country, Moonrise, Quaker Lover, Secret Love, Song of Reproach, Swapping Song, Three Tailors, Where To? RICHARD DYER-BENNET 11. 1962. Dyer-Bennet Records. Appendix Code: 11. BALLADS. 1963. Stinson SLP35. Appendix Code: SLP35. RICHARD DYER-BENNET 13. 1964. Dyer-Bennet Records. Appendix Code: 13. THE LOVELY MILLERESS. (DIE SCHOENE MUELLERIN.) 1978. Dyer-Bennet Records. 33674-33675. Appendix Code: song titles not listed in the appendices. RICHARD DYER-BENNET IN A PROGRAM OF DRAMATIC DECLAMATION OF THREE EXCERPTS FROM HOMER'S THE ODYSSEY. 1 sound tape reel. 1979. Library of Congress. THE ODYSSEY TAPES. 3/4" videocassette. 1980. Research Foundation, SUNY/the Arts on TV. RICHARD DYER-BENNET 1. 1997. Compact Disc. Smithsonian-Folkways. SF 40078. 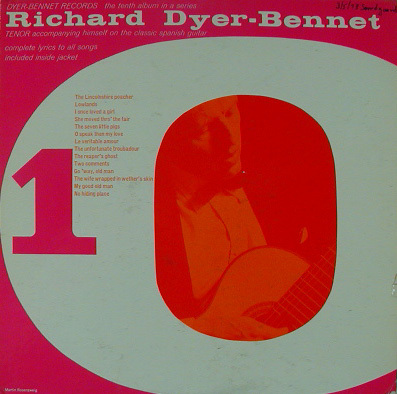 For song titles, see listing above for Richard Dyer-Bennet 1. Titles of these songs vary greatly. For clarity, I have standardized them. See Discography for complete album information, including album code.